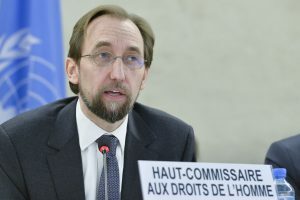 Speaking at the opening of the 28th session of the Human Rights Council in Geneva the High Commissioner highlighted the intimidation, bullying and reprisals directed towards human rights defenders and NGOs by governments that were increasingly setting a course towards authoritarianism and oppression. He reiterated that adherence to human rights principles were the only way to avoid global war and profound misery and deprivation. He went on to express concerns about grave human rights violations taking place in 40 different countries, including several in which the Edmund Rice Network has an active presence: India where the treatment of Rohingya refugees, the rise of intolerance towards religious and other minorities and threats to freedom of expression were a particular concern; the Philippines with the absence of credible investigations into reports of thousands of extrajudicial killings, threats to freedom of expression and peaceful assembly, the planned reintroduction of the death penalty and general disregard for human rights, the USA where the Government’s decision to end the Deferred Action for Childhood Arrivals program, the detention and deportation of well-established and law-abiding immigrants together with the rise of antisemitism and racism were all concerns, and South Sudan which is characterised by a lack of accountability for human rights violations, especially with regard to violence, and the arbitrary detention of people perceived to be critical of the Government. The full text of the High Commissioners statement can be found here.